The City of Artesia is pleased to announce a partnership with Artesia-based Cerritos Presbyterian Church to award up to three high school seniors or college students a $1,000 academic scholarship to the college, university, or trade school of their choice. The City encourages all students to pursue higher education and find their passion, and Cerritos Presbyterian Church is passionate about helping the local community. Therefore, we’re partnering for the second year to provide Artesia residents with an opportunity to earn an academic scholarship that will assist each student in their pursuit of higher education. 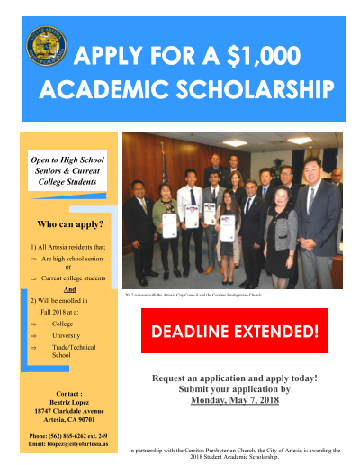 This scholarship opportunity is open to all high school seniors and college students who are residents of the City of Artesia and will be enrolled in college, university, or trade school in the fall of 2018. For more information, or to apply for the scholarship, please see the application and the scholarship qualifications. Completed applications should be submitted to City Hall no later than 5 pm on Monday, May 7, 2018. Winners will be announced during the June City Council meeting. Please direct all questions to Beatriz Lopez at blopez@cityofartesia.us.